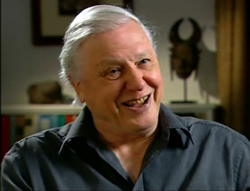 On June 16, 2008, Sir David Attenborough, now 82,1 gave us his responses to a range of questions asked by ABC (Australia) TV interviewer Andrew Denton on the latter’s new Elders program. Below, we comment on those parts of the program that dealt with creation/evolution and the Christian faith. The first 24 minutes covered familiar ground as we saw video clips of Sir David’s magnificent career as an investigative scientist and ‘the most travelled man on the planet’. Sir David’s contribution to bringing the wonders of God’s creation to the public through TV documentaries is immense. Although of course he, an atheistic evolutionist to the core, would not summarise his life’s work in any such God-glorifying terms. He began by describing how, at the age of 14, he found his first fossil. His father asked him, ‘Why do you think you find it in the middle of England when it’s obviously a sea creature?’ and suggested he find out why from the museum or from books. Comment: Sir David didn’t tell us in Denton’s interview how he answered his father’s question, but if he had checked the book of Genesis in the Bible he would have found the right answer—right logically, scientifically and historically. It was because there was once a world-wide flood. AD: You are strongly on record as being opposed to the concept of creationism. Why? Now all those things can’t be right. How do you decide which of them to believe? Well, there are good historical clues to be found and they are found everywhere, and they are all the same everywhere. I mean the truths about our own bodies, the shape of our own bodies and what they look like. Looking at fossils and looking at the rest of the animal creations [oops!] and so on. And if you do that, you come to the same conclusion, which is that all life has evolved over a very long period of time, and you can plot the course …. So simply from taking an objective point of view the answer is that life has evolved on this planet. 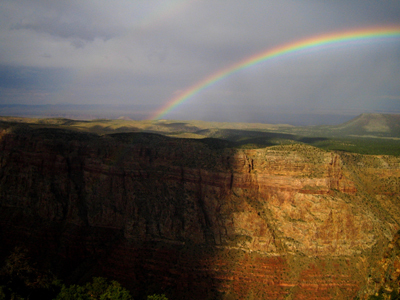 Comment: Yes, there are many creation beliefs. How to evaluate them? Well, one way would be to consider the truth about what happens to our bodies when we die. Do they return to water? Do they return to milk? Or do they return to dust? Hmmmm! See also Holy books? Which one are you going to trust? Concerning the people of ‘3,000 years ago who were wandering around the Middle East’, I presume you mean the nation of Israel who (because they disobeyed God) had to wander for 40 years in the wilderness of Sinai until all of that generation over the age of 20 had died (Numbers 14:26 ff. ), and then lived in the land of Palestine from 1451 BC to the time of the destruction of the temple in AD 70. Their Holy Book, called the Old Testament in the Bible, tells how God ‘formed man of dust from the ground, and breathed into his nostrils the breath of life; and man became a living being. And the Lord God planted a garden towards the east, in Eden; and there He placed the man whom He had formed.’ (Genesis 2:7–8). Eve was not taken from Adam’s feet to be under him, nor from his head to be above him, but from his side to be loved by him, to stand beside him, and to be held close to him. I suppose it is difficult for an evolutionist to sum up why he believes in evolution, in a single sentence or a phrase or a word. Not so for creationists: the word is ‘design’. Also, it is logically fallacious to try to refute a proposition by finding superficially similar beliefs, then pointing out the contradictions between them. All this proves is that mutually incompatible belief systems can’t all be right; it doesn’t prove that none of them is right. >DA: When people want to give God the credit, they nearly always take the example of butterflies or humming-birds or orchids or something lovely. But I think of a little boy sitting on the bank of a river in West Africa with a worm that is boring through his eyeball and which would certainly turn him blind within a few years. Now this God whom you say created every single species must presumably have created that worm … . I don’t find that compatible with the notion of God being a merciful creator God. If you are a creationist you actually believe that this worm along with tape worms and everything else actually was created at the same time as Adam, and that God said, ‘Okay, I’ll make Adam, and I’ll kick him out with every one of those little animal parasites. … ’ And if He didn’t do that, what has happened presumably is that these worms were related to other worms in the Garden of Eden … in which case they have changed so they couldn’t live anywhere else than where they do now. Comment: This is a theological argument rather than a scientific one—it is about what God supposedly would or would not do rather than about the scientific evidence. It’s ironic that Attenborough claims that evolution is about science, yet his main anti-creationism argument is theological rather than scientific! It’s ironic that Attenborough claims that evolution is about science, yet his main anti-creationism argument is theological rather than scientific! Attenborough ignores the Fall, as do most such critics. God did NOT design things this way, but they became this way after sin entered the world. See Death and Suffering Questions and Answers. He sets up a straw man about God creating every single species; rather God created separate kinds that diversified and even speciated. See Speciation Questions and Answers. Sir David is presumably talking about the parasite worm called Onchocerca volvulus, which causes a disease called Onchocerciasis or river blindness,6 although this is not designated as the ‘Eye Worm of Africa’ and also occurs in six South American countries. It is a leading cause of blindness worldwide. It is spread by the bite of various black flies. Here too the parasite migrates through the host’s body, eventually to the skin and the eyes. Treatment is by Invermectin. The adult worms in fact remain restricted to subcutaneous nodules. It is the microfilarial form of the parasite that causes problems by way of an intense inflammatory response (which may even be from the bacteria that ‘come along for the ride’, as antigens related to these, released by the dying parasite, seem to cause most of the inflammation). This response can be intense itching in the skin, but where the organism infects the cornea, this part of the eye can become inflamed. If the infection becomes chronic, the cornea can become scarred with resultant blindness. Sir David has elsewhere said, and implied again in the wording of this interview, that this worm ‘can live in no other way than in an innocent child’s eyeball’. Without minimizing the tragedy of river blindness, this is on several counts technically incorrect, as we have seen. For one thing, it is not designed to live in the eyeball and nowhere else, as he implies. And as we have already mentioned, degeneration following the Fall can explain many features of today’s parasites, which did not have the same life cycle pre-Fall. See The Creation Answers Book, chapter 6 (also available in pdf). Incidentally this is the third time (that we know of) when Sir David has regurgitated this standard skeptic line—and the second time he has told it in an interview with Andrew Denton in response to this question about God. See Why doesn’t Sir David Attenborough give credit to God? It’s time for Christians to let Sir David know, by whatever means possible, that his ‘argument’ has been refuted. AD: Does that mean that life has no meaning? DA: It would mean that life has evolved. I don’t think we can know there is a purpose of life. For all I know, there are all kinds of divine purposes that are beyond our cognition. Pain, suffering and death are not proofs of evolution, but of man’s rebellion against the One who in the beginning created everything ‘very good’ (Genesis 1:31). Comment: Why would it mean that life has evolved? Pain, suffering and death are not proofs of evolution, but of man’s rebellion against the One who in the beginning created everything ‘very good’ (Genesis 1:31). All those who want to know God’s purposes for our life or in regard to any other matter should read the book in which God tells us this. AD: Which is more powerful, faith or knowledge? DA: I think in the end you have to vote for rational thought because there are all kinds of beliefs that you can have that are wrong. By that I don’t mean religious beliefs. … Rationality has to win over faith. Comment: Rationality has to do with reason. Faith in God, the Creator, Lawgiver, Judge, and Saviour, is much more reasonable than the belief that everything in the world came into being from nothing in a big bang by means of a quantum fluctuation. Attenborough has faith that his reasoning ability is sound even though he believes that his brain evolved from that of an ape-like creature, where selection worked on survival value. Why should he trust in his own ‘free’ thoughts if they are the movements of atoms in his brain obeying the fixed laws of chemistry. See also how biblical faith provides the foundation for science, voluntary will, logic and morality, while atheistic evolution cannot. AD: What would you say to suicide bombers? DA: Faith is something that you can’t argue with. That’s one of the problems with faith. A suicide bomber believes he will be doing God’s will and as a consequence will have an after-life of great privilege. The only way you can argue against that is to say; ‘It’s not so.’ … But that doesn’t get you anywhere, so there is very little to be said to a suicide bomber. In stark contrast, the Christian’s holy book, the Bible, commands Christians in the words of Jesus: ‘Love your enemies, and pray for those who persecute you’ (Matthew 5:44). So which is right? Answer: ‘By their fruit you shall know them’! Faith in God, the Creator, Lawgiver, Judge, and Saviour, is much more reasonable than the belief that everything in the world came into being from nothing in a big bang by means of a quantum fluctuation. Also, leaving the subject of suicide bombers, there is no ideology that matches atheism coupled with evolution for its tendency to churn out mass murderers. This combination has been responsible for far more murders in the 20th century alone than the Crusades, Inquisition and witch burnings combined. Consider the Nazi genocide and euthanasia, and the millions butchered by Mao, Pol Pot and Stalin, who saw the evolutionary principle of survival of the fittest as the justification for their actions. Not surprisingly, atheism has been called ‘The opiate of the morally corrupt’7. Attenborough also willfully misunderstands the biblical concept of faith, which is based on evidence (e.g. 2 Peter 1:16). See also The Importance of Evidence and What is Faith? AD: Why does music mean so much to you? DA: I am absolutely convinced that music came to us before language. We were beating on stalactites and we were using drums and drumming on things just as chimpanzees are drumming on trees to signal to one another, which they undoubtedly are. Comment: Sir David is possibly trying to undermine Genesis here. According to the Bible, God speaks, and God made people in His image (Genesis 1:27–28). God gave Adam and Eve the ability to speak, and thus to be able to talk to Him and to each other, from the very first day of their creation. The ability to make and play musical instruments arose in the seventh generation after Adam (Genesis 4:16–21). See also Mithen’s music mystery magnified! DA (continued): Great minds can express themselves in music. Bach can communicate not only to his own people but across the centuries. Bach is about mercy and about love of humanity and a vision of the infinite—what that means I have no idea—but I can’t think of any other words to use to explain many a Bach cantata. AD: How should we deal with death? AD: As you have got older has your attitude towards death changed at all? >DA: Oh yes. I think about death every day. I think mainly of the problems I’m leaving for others, and of the cliché which we all wish—when it comes make it quick. AD: Do you have a sense of the after-life? AD: Does that worry you? DA: No. I’d be more worried if I thought there was Someone up there with a profit and loss account in terms of moral behaviour. But I see no evidence of that. Comment: The Bible tells us that God inhabits eternity (Isaiah 57:15) and that He dwells in Heaven (e.g. Deuteronomy 26:15). Another way of saying this is that God lives in the heavenly dimension or the dimensions of eternity and so He is transcendent to our world of three dimensions of space (length, breadth, depth) and one of time. Therefore we should not expect to see evidence of what happens in the heavenly dimension other than what God has chosen to reveal to us in his Word, the Bible. When a person dies, his/her soul/spirit exits this space-time world by crossing the event horizon of death. This is the boundary at which space and time end and timelessness begins (see The Gospel in time and space). In the Bible, God tells us that beyond death there are Heaven, Hell, and judgment to come (‘it is appointed unto man once to die, but after this the judgment’—Hebrews 9:27). The latter decides which of the two former we end up in, based on our faith (in this life) in Christ’s atoning death and Resurrection (Romans 10:9–13, 1 Corinthians 15:1–4). Heaven, Hell, and the final judgment all exist or occur within the dimensions of eternity. They can therefore never be examined by science, because they are all hidden behind an event horizon. This, however, does not mean that they are not real. Heaven, Hell, and the final judgment all exist or occur within the dimensions of eternity. They can therefore never be examined by science, because they are all hidden behind an event horizon. This, however, does not mean that they are not real. The concept is perfectly scientific, and they are in fact the ultimate reality. The materialistic credo propounded for so long by atheists, that the ‘here and now’ of our space-time continuum is the only reality, is scientifically unsound. Skeptics and atheists like David Attenborough, and others, ignore this at their peril. AD: Would you be found in profit or loss morally? DA: Who knows? Who knows what the moral code is? Comment: God knows. And He has set out His moral code in the Bible. Concerning the last judgment, the Bible tells us: ‘Then I saw a great white throne and Him who sat on it, from whose face the earth and the heaven fled away. And there was found no place for them. And I saw the dead, small and great, standing before God, and books were opened. And another book was opened, which is the Book of Life. And the dead were judged according to their works, by the things which were written in the books. The sea gave up the dead who were in it, and Death and Hades delivered up the dead who were in them. And they were judged, each one according to his works’ (Revelation 20:11–13). AD: You’re 82; what do you have left to learn? DA: Mostly materialistic stuff. I read evolutionary science all the time. Things that have been discovered in my lifetime are absolutely extraordinary. Comment: How sad, David, that you make time to read only materialistic evolutionary stuff. There is another point of view, outlined above, which you choose to disregard. DA (continued): The whole of genetics is so exciting … understanding the way in which our bodies are built, and all the other animals of the world are built—that is so exciting. Indeed, the genetic machinery is excellent evidence of design, and a huge problem for evolution. E.g. we have incredibly complex machines called ribosomes to read the genetic instructions on DNA, yet the instructions to build ribosomes are themselves on the DNA. And the reading requires energy in the form of ATP (and GTP), yet ATP is made by the world’s tiniest motor (ATP synthase), the instructions of which are themselves coded on DNA and read by ribosomes … vicious circles that evolutionary theory hasn’t solved. AD: (discussing reincarnation) If you were to come back as an animal, which would you choose? >DA: I might have said a male bird of paradise, but [tongue in cheek] how about a sloth—hanging upside down from a tree and doing nothing much most of the day, chomping a leaf here and there, wondering about whether to move over to the next branch … that wouldn’t be bad! AD: That wouldn’t be you, somehow. Reincarnation (and Islam) seem to be politically correct forms of religion allowed by the materialistic elites. But this should not hide the huge problems with such beliefs—see Reincarnation vs Creation. Our author, Russell Grigg, is also an octogenarian; he’s 81. Return to text. See Grigg, R., Occam’s Razor and creation/evolution, 22 May 2007. Return to text. See course1.winona.edu/kbates/460prog/Loaloa.htm. Return to text. See http://wrongdiagnosis.com/medical/loa_loa.htm Return to text. Wikipedia: Onchocerciasis Return to text. Dinesh D’Souza, What’s So Great About Christianity? Regnery, 2007; reviewed by Lita Cosner, Journal of Creation 22(2):32–35, 2008. Return to text.